Sharp Material Hauler Truck with 3 Axles! Sharp truck, this blue Adam 3 lift axle rig. How much can you lift with something like this? This truck belongs to a father and son team out of Minnesota State. The dad owns the truck company, and the son works there. 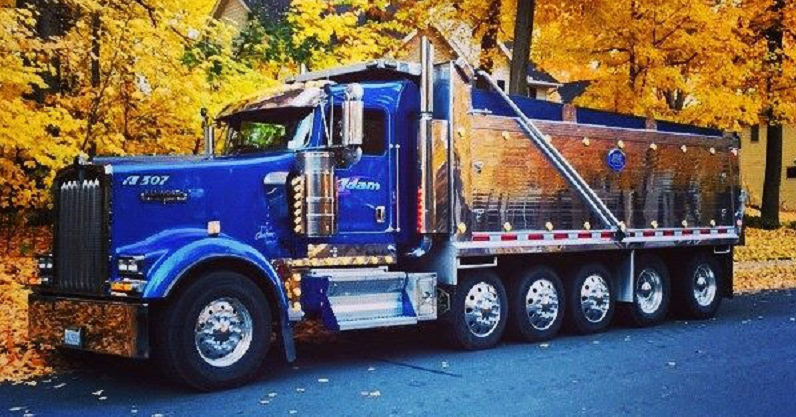 The company hauls hot mix (asphalt) every day in this customized dump truck. But those drop axles. Three drop axles? How much can they haul with that (legally)? Do they give this truck a workout? Are those lift axles steerable? Anyway, a company that spends that much time and attention to their vehicle probably does a good job elsewhere as well, and is likely trying to build a good reputation for their company out in MN. How do they keep a work truck looking clean? We’re going to update this write up again after some people comment on this truck, so if you’re curious about it too, check back and see what everybody adds to it.